The NetApp EF series of all-flash arrays are designed specifically for database-driven environments demanding maximum performance, reliability, and availability. 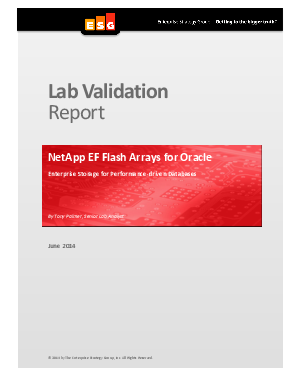 This ESG Lab Report documents the real world performance, reliability, availability, and serviceability of NetApp EF-Series flash arrays in Oracle database environments. A combination of hands on testing by ESG Lab and audited in-house performance testing executed by NetApp were used to create this report. In this report, you’ll learn how ESG validated NetApp’s EF-550 flash array performance of over 400,000 IOPS with sub-millisecond latency, while maintaining 6 nine’s availability.